Inspired by Star Trek, the creators of Alexa wanted to be like the crew of the USS Enterprise, who would simply shout out ‘computer’ then give commands or ask questions to the all-knowing devise. The guys behind Alexa wanted to replicate this, but felt that ‘computer’ was a word used to commonly is everyday life. And thus Alexa was born, as having a word that has soft vowels and contains an X is unusual. Amazon Echo devises and Alexa have advanced leaps and bound since its original conception and the dream of having a voice controlled assistant is a reality, as now over 12,000 products have ‘Alexa Skills’. Being able to switch lights on and off with your voice seems like the peak of technology and the Amazon echo devices have been incredibly popular. However, with smart homes and smart security becoming more and more common, we look at how you can use your Amazon Echo devise to secure and protect your home from burglars. Now the Amazon Echo can’t do this alone, so we have compiled a list of the best home security cameras, lights, doorbells and many more gadgets you can connect with Alexa. There are a few different Echo’s you can choose from; the original Echo (2nd gen) to the newest Echo Show. The Echo (gen 2) is smaller than its predecessor and has a microphone that is more sensitive and will reach further, it’s also cheaper. So if you’re looking for a good all-rounder to make your entire home smart then this could be the one for you. The Echo Plus is what you would expect, the standard Echo with a few things added. The Plus has an inbuilt ‘Zigbee Hub’ which means it can directly connect to certain smart home devises, this means that instead of adding your devises one by one, the Plus will ‘discover’ them. 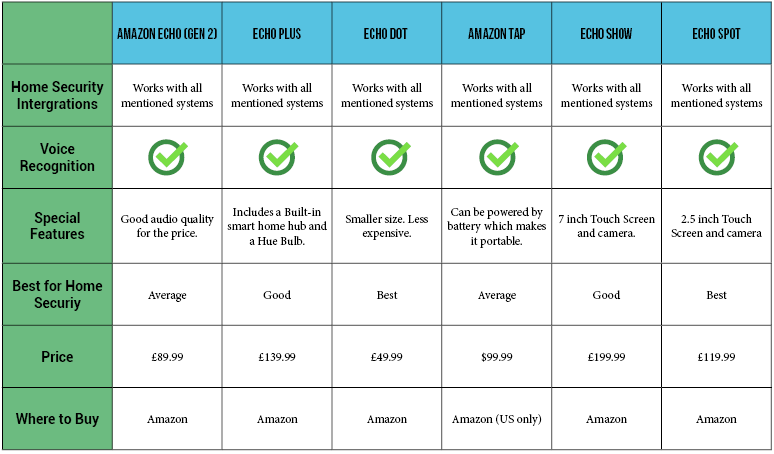 The Echo Dot is the smaller version of the Echo, it’s cheaper too, so if you’re looking to keep the cost down the Dot might be the one for you. It’s as smart as the original Echo, the difference is the sound quality; the speaker isn’t much better than the one on your phone. However if you are just buying an Echo for security, the Dot is a safe bet. The Echo Show is one of the newer versions of the Amazon Echo. It boasts a 7 inch touch screen, which allows you to gain audio and visual feedback when you ask it things. In terms of home security, it allows you to access live footage from compatible security cameras. The Show can also be used for video calling and has an in built microphone for voice recognition. The Nest Cam Indoor, is a smart security camera that sits in your home and allows you to view your home from anywhere, it also contains speakers that allow you to speak through it, from anywhere. With the Nest Indoor Cam you can ask Alexa to watch your live video feed on the Amazon Echo Show or Echo Spot display. Also if you have an Amazon fire TV devise you can even watch it on a TV. 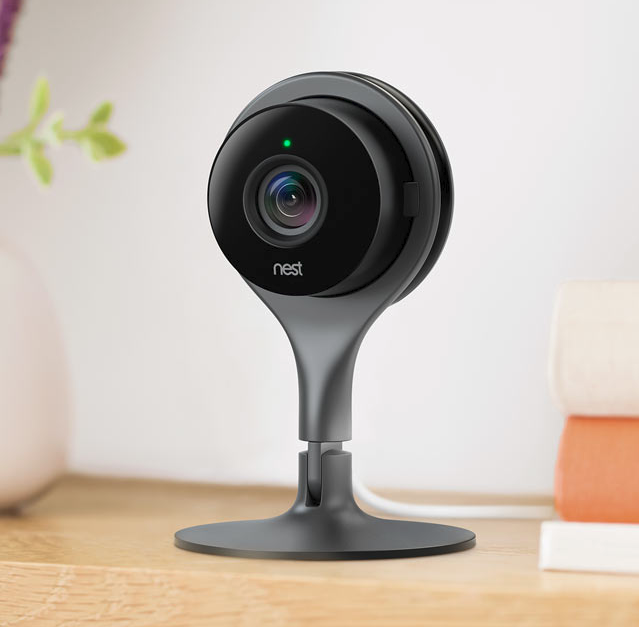 The Nest Cam Indoor provides 1080p video at 30fps, which for this kind of camera is the best picture quality you are going to get. The downside of the Nest Indoor Cam is that you have to subscribe to ‘Nest Aware’ and pay monthly to view your recorded footage; this starts at £5 per month for 24 hours of storage. Nest is more geared up to work with Google Home; however you can us the Alexa app to connect with Alexa and your other Amazon products. You will just need to ‘enable’ Nest camera on the Alexa App. Seeing as Amazon brought Ring for around for over $1 billion earlier this year, this is one of the most compatible gadgets you can get to go with your Amazon Echo. 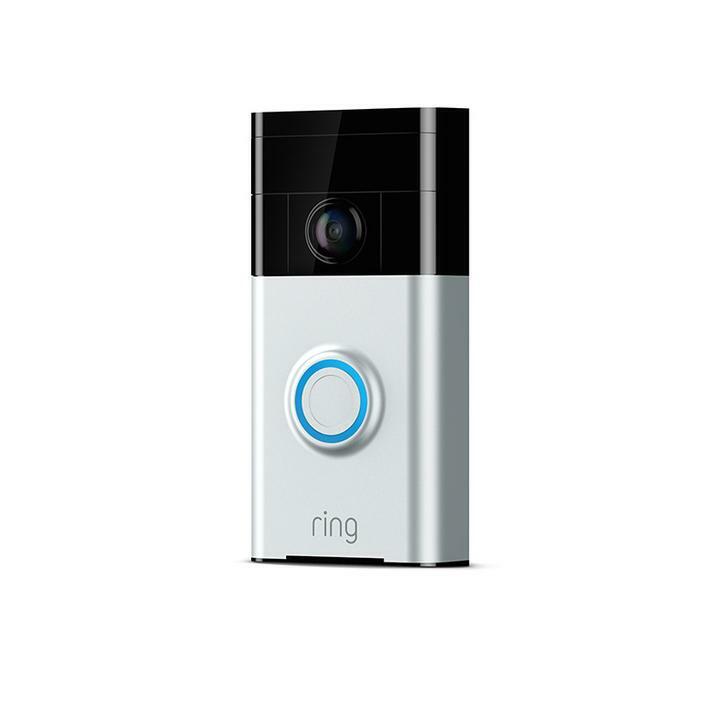 Ring is essentially a video doorbell that enables you to see, hear and speak to anyone at your door. Once you have enabled Ring on your Alexa app you can simply ask… “Alexa, show my front door” and boom, you get the live feed from your front door. This is great if you are home alone and want to check out who is at the door before you answer it. If you choose to have the video doorbell then the hope is in the future Alexa can ‘learn’ about your families habits. For instance if a child is walking home from school while a parent is still at work, you will be able to ask “Alexa…is David home yet?” And be shown a video image of the child arriving home. This kind of facial recognition might be a couple of years off, but it’s the tip of the iceberg for what Amazon could do with the Ring video doorbell. The possibilities for home security are endless when it comes to Amazon and Ring. Canary offers a range of some security products, including the Canary itself. 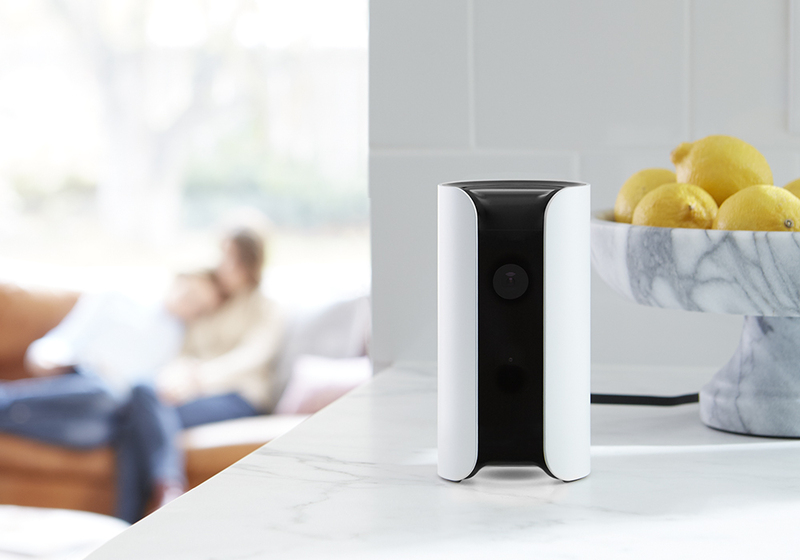 The Canary is a all-in-one smart home security solution. It uses AI technology, HD camera and microphone plus a 90 decibel siren to protect your home. What’s good about the Canary is that all you need is Wi-Fi, you just place it somewhere in your home and you’re ready to go. You can download an app that allows you to view live footage of your home wherever you are and in an emergency you can ether sound the siren or make an emergency call. Another bonus of the Canary is that it will ‘auto-arm’ when you are not around, so you don’t have to remember to put it on. It will also ‘learn’ what normal activity is in your home and will detect if anything is ‘different’. You can integrate Canary with your Amazon products and Alexa similar to the Nest Cam Indoor. You will be able to ask Alexa to stream live video from your Canary. Yale is another company that Amazon has partnered with for home security. By connecting a Yale smart door lock you can use Alexa to control your door. By saying specific phrases to Alexa, you will trigger responses, such as “Alexa…is the back door locked?” will trigger the devise to check the status of your lock. The feature which people find the coolest is the “Alexa…lock the front door” feature. This allows you to lock your door from anywhere in your house, giving you the peace of mind that you will not be getting unwanted visitors at night. For security reasons you will be able to unlock your door using voice commands. But Yale offers lots of other advanced way to unlock a door with its keyless entry locks; all you need is your phone to gain entry to the house. 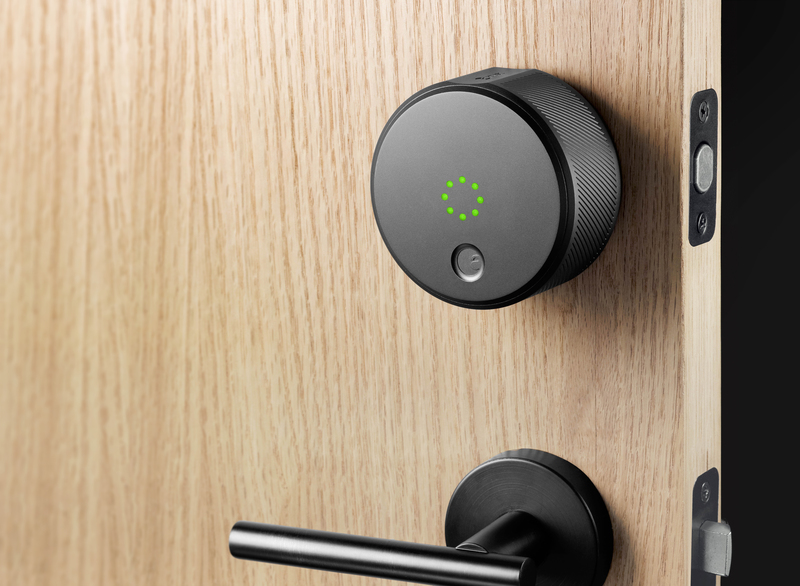 August smart locks were the first smart locks to support Alexa. August enables you to ask Alexa to lock the front door and check if the door is locked from anywhere. By connecting your August devices to Alex you are able to view your front door camera by asking “Alexa…show me my front door camera” and once you are happy to let someone in you can ask Alexa to unlock the front door, to keep it secure you will be prompted to provide your secure PIN code to unlock the door. August and Amazon are promoting ease of use with their products, they want you to be able to let your friends in, even if you are busy cooking in the kitchen. With all this advancement and new technology to help secure your home, people are questioning how secure Alexa is. One main thing that concerns people is that their smart home devise is always listening. Clearly they are listening for any commands you might throw at it, but how much can it hear? Well Alexa does record what you are saying and sends it to a server, but that only when it’s triggered by you saying ‘Alexa’. Alexa does have a habit of being triggered by things other than your voice television or radio for instance, so there is a chance snippets of your life will be sent to a server and stored. Amazon obviously have some of the best security in the world to keep this data safe, so it is unlikely that anyone could access this data and use it. However nothing is 100% secure, so there is always a small chance that something could happen. If you choose to have an Amazon Echo product and Alexa in your home then you will never have 100% privacy. If you did have complete privacy Amazon Echo’s and all the other home assistance would be completely useless. You can however make your Amazon Echo more secure with a few simple steps. Mute it when it’s not in use, this will turn off the ‘always listening’ function until you unmute it again, this is easy on the Amazon Echo and there is a ‘mute’ button on the top which you simply press. There is also an option to erase your old recordings; go to your Amazon account and look under ‘manage my device’ and you can delete your entire history or individual queries for yourself. It’s also wise to disconnect the calendar feature from Alexa, as a hacker could gain access and know when you are planning to be away from home. Anything that is connected to the internet is potentially hackable, so there could be a risk of hacking with an Amazon Echo product. It’s more likely that the hacker is your child who asks Alexa to send them toys, which if you have the shopping mode enabled, could happen. There is also a risk that someone with hacking skills could turn your Amazon Echo into a listening device. But you have to weigh up the risks. Why would someone want to listen in on the average person’s life? There are easier and more effective ways to get someone’s bank account details. We’ve mentioned that some of the security systems that work with Alexa let you control the door locks with your voice, you could be running the risk that anyone could shout ‘Alexa…open the door!’ a few do offer a pin number to keep it safe, which is something we suggest you have. It is also advisable to enable the mute function while you are out of the house to stop this from happening as well. There has also been some talk about hackers being able to control Alexa by using ultrasonic frequencies. This has been named ‘Dolphin Attack’. It involves hackers broadcasting a frequency too high for the human ear to hear, but is audible for your microphone on your Amazon Echo product. 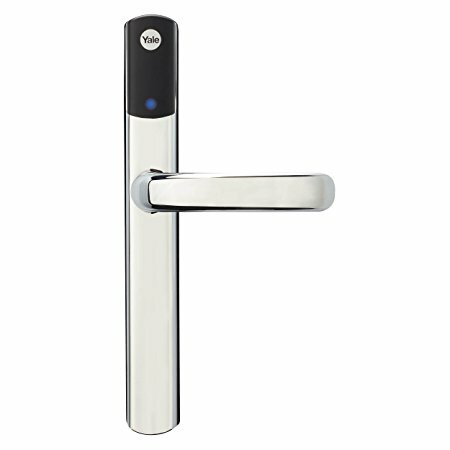 In theory a person would be able to ‘whisper’ commands you cannot hear to your smart device, and if your smart lock is connected, potentially open your door. As advised before, turning off your microphone function when leaving the house is the best way to protect against this kind of attack. If it’s the fear of a burglar hacking you smart door or alarm system and getting in to you home, that’s stopping you from getting an Amazon Echo and related products, then rest easy. Most burglars are opportunistic and are more likely to kick your door in, smash a window or pick a lock to gain entry to your home. The fact that you have a camera on your door bell or a smart security system may even put burglars off from breaking in, as they are more likely to be identified and caught. On the other hand, when you have a flashy or expensive security system, you run the risk of thieves thinking you have items worth stealing locked inside. But this can be the case with a smart lock, or non smart lock that is out of the ordinary. So is it worth getting an Amazon Echo with Alexa and using it for home security? Well there are definite benefits to having a voice activated security system, as it makes it easier to secure your home. Being able to ask Alexa to arm your security system means you are more likely to remember to do it. Those with children could benefit by using the smart lock and doorbell camera to check on the safety of their children. However if you are not very technology minded or don’t have a smart phone, then you will struggle to make full use of the systems. It could ultimately make life more difficult for you and lead to unnecessary spending. However, it is looking more and more likely that smart home hubs, including smart security systems will be common place, with devices being voice controlled.